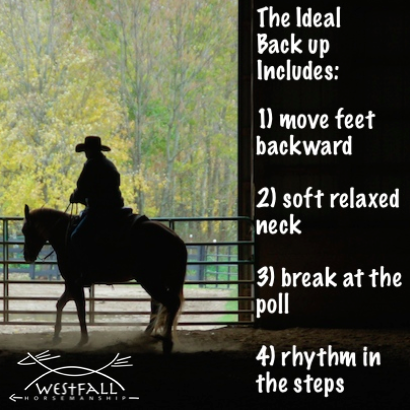 The Back Up: Giving a horse the idea is like planting a seed. When I am introducing a new idea to a horse it is usually done in a very subtle way. I ask for a tiny amount of response and immediately release. 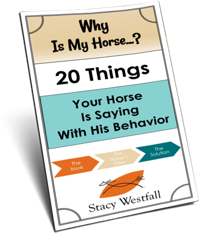 Even though the horse may not get the response completely correct, I reward for movement in the correct direction. Lets look at an example. While I might have all of these goals in mind I will begin by planting a seed. This could be on the ground, during ground driving, or it could be while mounted. Either way my main focus when beginning is to get the feet to move backward…even just a little bit. 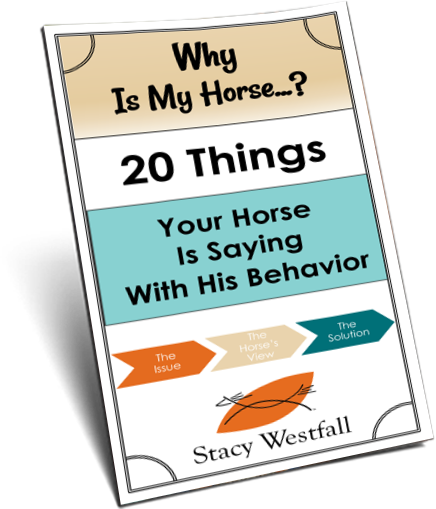 Ideally the horse will not only take a step but will also remain soft and quiet…but that doesn’t always happen. It is more likely that the horse will try something that has worked before in the past. That could be turning to the left or right or even walking forward. It is always interesting to see how many ideas the horse could have depending on their past history. My job is to apply only enough pressure to motivate the horse to try something…and then reward any movement in this direction. When someone is planting a seed in a spring garden they treat it gently and try to give it the best chance. They prepare the soil, they monitor the water, they don’t walk on the new seeds. That first step backward may not have all of the idea characteristics but if you are gentle and quick to reward it is amazing how quickly the horse will grow that idea. Their neck may not be perfectly soft, they may not break at the pole and they will rarely have good rhythm…but those will come. Unless the horse shows a dramatic amount of resistance in their neck and poll my main focus will be moving their feet. Later as that seed grows stronger I will begin to focus on planting the second seed of more softness to grow along side the original seed. Fostering a new thought or a new idea in a horses mind is very similar to planting a seed. ← Side effect of snake bite on horse almost a year later. just now seeing this….great article…wonder why it didn’t show up on your FB page Stacy? ?